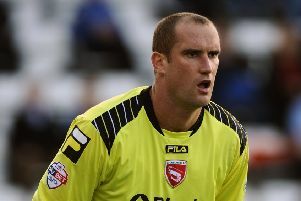 On-loan Morecambe goalkeeper Scott Davies is to return to Fleetwood despite both player and manager wanting him to stay at the Globe Arena. The Shrimps’ Wembley winner has impressed since being brought in as cover for the injured Barry Roche but finances dictate he is heading back to Highbury, at least for the time being. Boss Jim Bentley said: “I’d love to keep Scott. “He’s been superb for us, he’s disappointed with the goal against Carlisle (on Boxing Day) but overall everyone will agree and even the person who’s sitting on the bench, Andreas Arestidou, who I’ve got 100 per cent confidence in, will be thinking he’s been excellent. “I want to keep him but we haven’t got an open cheque book and finances dictate things sometimes. “We cut our cloth accordingly and it is what it is. Bentley says one or two players could leave the club on loan as he bids to freshen up the squad. He said: “There’s players knocking at the door asking to play, they’re a bit frustrated that they’re not playing regularly, and one or two might have to go before we bring one or two in. “I do want to freshen the squad up, I know the areas I want to improve and certainly the priority is to keep Scott Davies. “Him coming in has coincided with keeping more clean sheets. Whether that’s down to the formation or him.